A modified Standard Missile-2 (SM-2) is launched June 5 from the guided-missile cruiser USS Lake Erie in the Pacific Ocean. The U.S.Missile Defense Agency (MDA) said it conducted its second successful test June5 of a sea-based interceptor intended to knock down incoming missiles in theirterminal phase of flight. U.S. NavyRear Adm. Brad Hicks, Aegis Ballistic Missile Defense program manager at MDA, said in a June 5 conference call with reporters that the agency is planning to deploy theStandard Missile-2 Block 4 in the near future as an interim measure until it candevelop a more capable missile. There aretwo versions of the Aegissea-based missile defense, one intended to engage missiles in theirmidcourse phase of flight and one for the terminal phase, when the warheads arenearing their target. The midcourse system, which utilizes the StandardMissile-3 interceptor, has been successfully tested several times to date andwas used earlier this year to destroy a wayward U.S. spy satellite. Theterminal defense version of the Aegis system is of interest to commanders toaugment the ground-based Patriot interceptor system, or to fill gaps wherePatriots are not deployed, Hicks said. 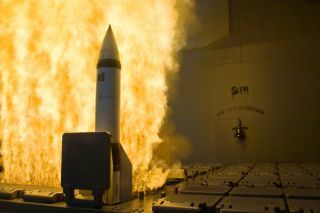 LockheedMartin Maritime Systems and Sensors of Moorestown, N.J., is the primecontractor for the Aegis missile defense effort. The Standard Missile-2 Block4, initially developed as a self-protection measure for ships against cruisemissiles and aircraft, is built by Raytheon Missile Systems of Tucson, Ariz.
During theJune 5 test, which took place at the Pacific Missile Test Range off the coastof Hawaii, an Aegis ship fired two Standard Missile-2 Block 4 rockets, both ofwhich exploded near the incoming target as planned, Hicks said. Unlike theStandard Missile-3, which engages its targets outside the atmosphere anddestroys them by force of direct impact, the Standard Missile-2 Block 4 isdesigned to explode near its target within the atmosphere. The target isdestroyed by fragments from the blast. Hicks said the target in this testfeatured a warhead that did not separate from its booster, similar to a Scud missile,but declined to provide further details except to say it was built outside ofthe United States. TheStandard Missile-3 already is deployed on a small number of Aegis ships. The MDA plans to equip ships with both types of interceptors in order to allow them to shoot atincoming targets during different phases of flight, Hicks said. This willrequire a software modification to enable the ships to fire the StandardMissile-2 Block 4, he said. The MDA is planning a test for late 2008 that would involve a Standard Missile-3 interceptor firedfrom a Japanese ship, Hicks said. The agency may conduct another test in whicha Standard Missile-3 will be fired from a U.S. ship if it can secure thefunding to do so, he said. Land-baseddeployment of the Standard Missile-3 also is possible in the future, though the MDA has no firm plans for that at the moment, Hicks said. The agency has firedthe missiles from land in the past during testing at White Sands Missile Range, he said.